Relaxed, Recharged, and Ready to Go! The extended holiday break is over. 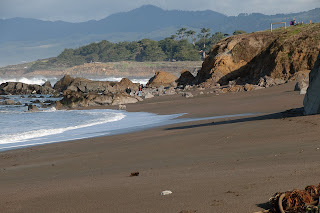 Our last stretch of time off for a while was our annual trip to Cambria. We always go down for our anniversary weekend (our 17th this year) and spend a few days in what we refer to as “our” house. 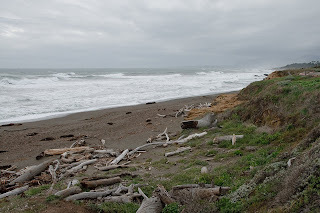 This three-bedroom house, directly across the street from the Santa Rosa Creek outlet to the Pacific Ocean on San Simeon Beach is too much house for the two of us, but we rent it anyway. We’ve been staying there for years and have become quite attached to it. This year we filled a little more of it as we took our daughter and grandson with us, along with Perry and Della, our six-month old Shih-Tzu puppies. Normally, we visit quite a few of our favorite wineries in nearby Paso Robles. If you’ve never been, I highly recommend you check it out. Email me for a list of wineries to visit. This year, we only went to one, and that was because we had pre-ordered from this winery and had them hold it for pickup. Otherwise, we just took the time to relax, unwind, and recharge. The baby enjoyed being in a different environment and gazed in amazement at the beach and ocean. Perry and Della got spoiled by the long walks along the beach, and all the attention they got from showing off their cuteness. I got in some shooting, of course, and will get around to posting something on the gallery later this week. This annual getaway is part of an annual ritual where we take some time thinking about the things we want to do in the upcoming year. These are tough economic times for businesses and customers. Toward the end of last year, we witnessed first-hand significant changes in wedding couples expectations of what they could do. I’ve already heard of couples opting to cut out photography altogether. That’s a pretty harsh step to take, considering the longest lasting tangible memory of your wedding day is your pictures. One thing we won’t be doing is cutting back on our services. We tell wedding stories. To do that, we have to capture the entire story, not just a few hours. We also won’t be raising prices. Too many couples can’t afford that. We will, however, offer more choices; more albums, more print options, cards, notepads, DVD storybooks, and a bunch of other exciting options. I just got back from the Wedding and Portrait Photographers International convention with loads of ideas and product offerings. More choices gives you more options. Knowing that we captured everything lets you hold onto the ability to get the album you dreamed of having, even if you have to wait a year to get it. For Cassandra and I, it’s about the story. We’re waiting to tell yours.